In this chapter we present the transitions approach as an integrated perspective to understand and possibly orient our society towards sustainable development. Since the concept of sustainability is inherently normative, subjective and ambiguous, we argue that (unlike some more traditional approaches to sustainable development) we should focus on an open facilitation and stimulation of social processes towards sustainability. The transitions approach and transition management specifically, seek to deal with ongoing changes in society in an evolutionary manner so as to influence these ongoing changes in terms of speed and direction: towards sustainability. A transitions approach to explore sustainability transitions poses novel challenges for research: there are no unequivocal answers, nor it is clear how these processes should be governed. We conclude our analysis by formulating the basic research questions central to the search for governance for sustainability, and by reflecting on the role of science in sustainability transitions. The present paper is a product of research that has been conducted with the support of the KSI II.2 Research Subprogram “The dynamics of transitions” (www.ksinetwork.nl). 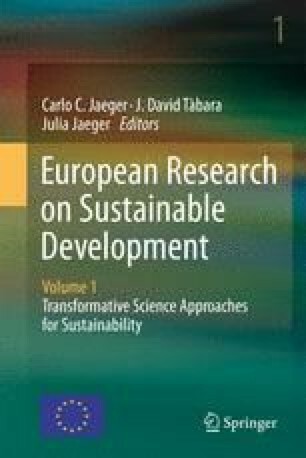 An earlier version of the present paper had been presented in the EU Conference, Sustainable Development: A challenge for European Research, 28–29 May 2009, Brussels, Belgium.